REVISORS found another irregularity in the recounting of votes in Vice-Presidential race in 2016, there are missing voters receipt from several ballot boxes from Balatan town in Camarines Sur, the home province of Vice President Leni Robredo. 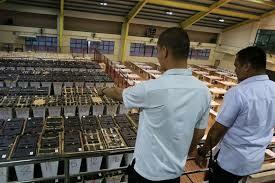 Onset of the recount, several wet ballot boxes were found from Bato and Baao towns as well as Naga City in Camarines Sur. Presidential Electoral Tribunal insider revealed that this irregularity could mean that the votes cast by the voters are not the results transmitted by the vote counting machines.